All-on-4 Fixed Dentures Available at our Odessa Dentistry! There are many reasons why people lose teeth, but a lost tooth isn't a lost cause. Our Odessa office utilizes modern dentistry that has designed tooth rehabilitation methods for restoring the healthy smile you are used to. All-on-4 treatment is one method known to replace missing teeth and traditional dentures. The procedure is painless and has grown in popularity due to its immediate results. Regain your quality of life with All-on-4 dentures and receive a natural and healthy-looking smile today. What Are All-on-4 Fixed Dentures? The All-on-4 treatment is a surgical and prosthetic procedure designed for the rehabilitation of tooth loss. The treatment consists of four metal implants that are placed into a high bone density area of the jaw. 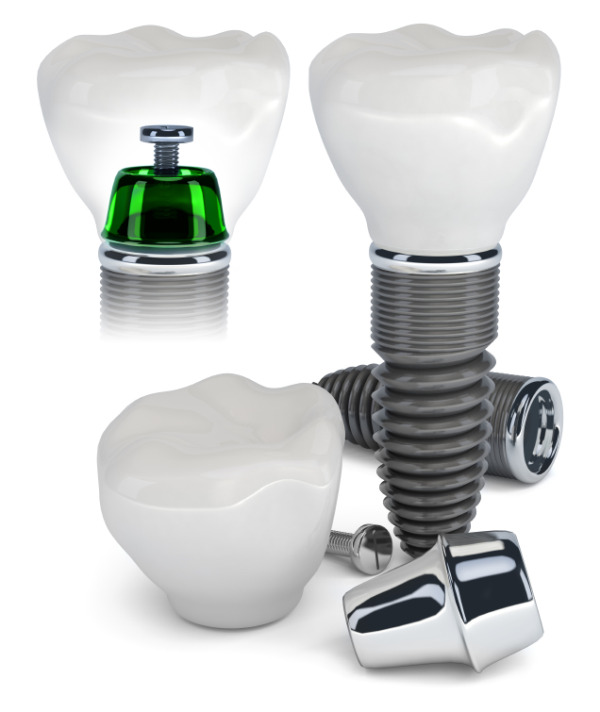 The implants are used to support a customized prosthesis containing 12 to 14 teeth that is permanently fixed to the mouth. All-on-4 fixed dentures are a permanent, screw-retained, same-day solution to the loss of multiple teeth. All-on-4 dentures are a great solution for patients with significant tooth loss, or for those who are not able to receive dental implants due to insufficient bone density in the jaw. Patients can almost always bypass any bone grafting with All-on-4 dentures, and are guaranteed a full set of replacement teeth in just one day. Patients experience minimal pain or downtime after their procedure is complete, and since All-on-4 dentures are fixed to the jaw bone, none of the slipping and sliding associated with removable dentures is present. Fixed dentures can also help to preserve bone in the jaw and are maintained with the same oral care as natural teeth. Your quality of life is immediately improved with an All-on-4 procedure and allows you to enjoy the freedom and comfort of a natural-looking smile. At Dental Solutions, PA, we perform same day All-on-4 fixed denture procedures. During your initial consultation, we perform a CAT scan to assess the amount of bone present in the jaw and use 3-D digital imaging to provide a basis for the custom impressions created for your mouth. If there are teeth remaining in the mouth, they will be removed and replaced with a set of implants and a temporary prosthesis. After 3 to 6 months, the temporary prosthesis will be removed and replaced with a permanent set. With the help of sedation dentistry your procedure becomes painless and can expect to see an immediate improvement in the functionality of your teeth. Our dental team at Dental Solutions, PA is here to answer any questions you have. Contact us at our Odessa, TX office today for a free consultation and find out if All-on-4 dentures are right for you!